If you live in the middle of nowhere like me, you probably have a hard time with the level of service offered by Deutsche Bahn (the leading railway company in Germany). Small towns are poorly linked to the transport network, the seats on the local trains are uncomfortable, the trains unpunctual, the fare too expensive for what you get, there are no decent connections at night, and, if you’re unlucky and the train is full, you have to spend the whole ride standing. That’s what comes to my mind when I think of train travel in Germany, which is why I use Deutsche Bahn next to never. The first class in “Regional Express” is a big joke. The only value you get on top of second class is the seat spacing; in some coaches, you might get slightly wider seats and only three seats per row. However, in this case, first class and second class were all in the same coach without even a partition. Overall, the seats are very uncomfortable and there was only a tiny table at the window for passengers to set things down on. There are no power socket-outlets and working during your journey would be very difficult. The luggage rack must also be a joke, because nothing more than a briefcase could fit into it; even a small daypack would have problems fitting. So it’s no wonder that passengers use two seats, one for themselves and one for the luggage. By the way, you can’t make a seat reservation on an RE. In a Regional Express train, you really do get little for your money, especially if you only ride occasionally and don’t have a BahnCard. 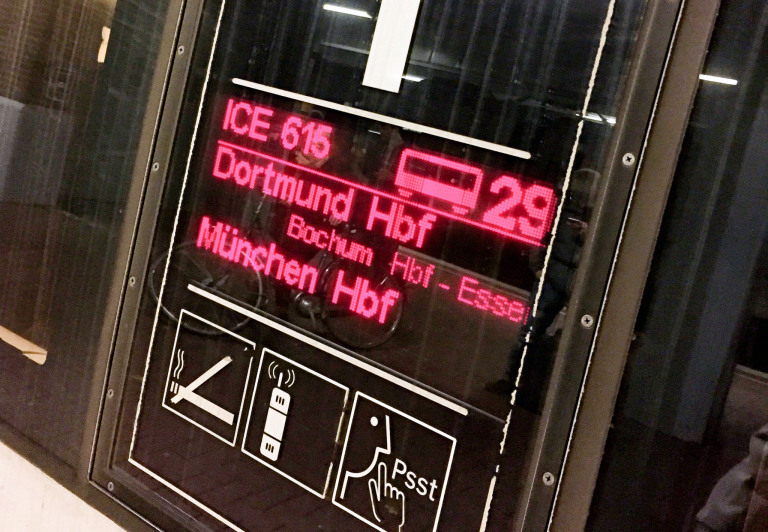 The ICE has a completely different look, but in both cases Deutsche Bahn managed to arrange the cars in an order that did not correspond to the order displayed in the station. There was neither an announcement indicating that the cars were in reverse order nor an updated track display. Once you do manage to find your reserved seat, you can relax comfortably, because the seat is comfortable, there is ample legroom and luggage fits on the rack. In both cases, the train crew were very nice and we were well looked after. On the outward journey, we befittingly tasted some whisky, I treated myself to a chili con carne and, after hearing an overhead announcement about the on-board bistro, a currywurst. On the way back, I wanted to enjoy a wheat beer while watching a movie, but this was not possible, because the free Wi-Fi was not working on either ICE journey. The hotspot is provided by Deutsche Telekom, but their hotline could not be reached by telephone, and the standard excuses were all I got from Twitter. A pity really. The folding table is of limited use when trying to work on a laptop. I tried multiple seat adjustments, but could never find a comfortable sitting position for working. We won’t even discuss ergonomics. The ICE service from Deutsche Bahn is really not that great a deal, although the ambience is fitting. I can’t judge how it is in second class, because I’ve never ridden in it. On the way to Dortmund, both trains were on time, but not on the return trip, when the ICE was almost 30 minutes late, which would have meant that we would no longer make our connecting Regional Express, which, of course, was the last train of the day back. When we told our newly boarded train conductor, she first reacted in a prissy, bureaucratic manner, but then checked into our concerns and hurried off to organise a solution. In the end, the Regional Express was stood there waiting for our train to arrive and we made it home after all. If that had not been the case, Deutsche Bahn would have had to pay for a taxi ride home instead. Secretly, I actually wanted that to happen, because a taxi ride would have been faster and more convenient. If I lived in a city with good ICE connections, I would certainly use the services of Deutsche Bahn more regularly. But I only do so in exceptional cases, because, in my personal situation, a trip by aeroplane or car is usually faster and cheaper. If you look at other countries, train travel there is often quite different. The trains are on time, the coaches are where they’re supposed to be, and it’s usually more convenient and cheaper. We Germans are still supposed to be the world champions in covering our behinds, loving perfection and doing everything with technical precision. Why, then, are there so many shortcomings with Deutsche Bahn? 1. Taking the last plane or train home always means we are taking a certain risk that we may not get our connection. The delay could be due to weather and so forth if we talk about planes. I took a plane to Geneva – last one that day and missed the train home. Since then I refrain taking the last plane home from anywhere…. because I do not want to get stranded somewhere instead of arriving at my home. 2. Yes, a few things seem to be wrong with Deutsche Bahn. I wanted to travel from Cologne to Amsterdam. The train – an ICe – was ready. Unfortunatel, the whole system had to be rebooted. So all systems were shut down including the lights being turned off. We arrived more than an hour late and where lucky that we still got our reserved room at our hotel. 3. While DB manages to clean lavatories on ICEs, this is not the case on EC or IC trains. Travelling from Cologne to Zurich on an EC by Swiss Federal Railways (their coaches), toilets were not cleaned…. but in Basel a cleaning crew arrived…. A train ride of such a length requires that somewhere in between, toilets are being cleaned… something that we have come to expect with ICE trains. Why should we not get such service with an IC or EC (Eurocity) train? Hello Urs, thank you for your comment. There is not all bad if you ride with the trains of Deutsche Bahn, but there is much room for improvement. The biggest problem is the railway monopoly of DB. This allows them to put their failure on the backs of the customers who rely on timely trains.